Talk about a winner. Take Monopoly, combine it with Lovecraft, carve some awesome-looking horrors to populate the game board, and go to Kickstarter to collect the money. All is well and good, unless of course no one actually comes through with the games, rewards, and goodies promised to Kickstarter followers. That fraud is what caused the Federal Trade Commission (FTC) to go after a gaming company rather than its usual big-name targets. In the first case of its kind, the FTC is taking on Kickstarter frauds. 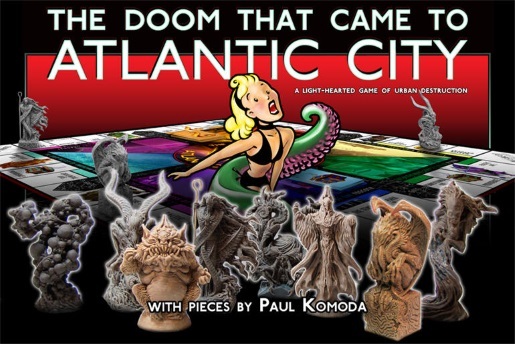 The game was called The Doom That Came To Atlantic City, and as you can see by the art, it looks like a lot of fun. Artist Lee Moyer and game designer Keith Baker came up with the idea, which they pitched to newly-formed board-game company The Forking Path, run by Erik Chevalier. The funding was successful, raising $122,874 in May 2012, well past the $35,000 goal. Unfortunately for Moyer and Baker, Chevalier took off with the money and nobody got the promised game. Hence, the FTC stepped in–not in a pair of Sketchers Shape-Ups–and went after Chevalier. He’s now banned from crowdfunding and will be forced to repay backers from his pocket after spending their money on his personal needs.